The ink used in early India since at least the 4th century BC was called masi, which was an admixture of several chemical components. Indian documents written in Kharosthi with ink have been unearthed in Xinjiang. 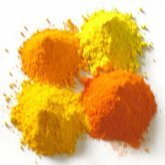 Ochre or Ocher (pronounced /\'əʊ.kə(r)/, from the Greek ὠχρός, yellow) is a color, usually described as golden-yellow or light yellow brown.